For last few months I did not blog because I was not able to write anything at all. People say that I was suffering from writer’s block. Overcoming this so called writer’s block I made a comeback and now I am writing like never before. I love writing and thus I am taking the full advantage of this peak time. But sigh! My Airtel GPRS connection betrayed me badly…I still regret that why on earth I took this connection. Now when I am writing almost everyday and enjoying blogging again; I don’t have net connection at home. On top of that my final exams are just around the corner and my mountain like syllabus is crackling and making all kind of strange faces at me all the time. So my mom has got another strong reason for not permitting me to have the internet connection till the time my exams are over. May be this beautiful tag is my last post before I get my internet back. The reason for doing it is that rite now I am in my college lab so I don’t have much time to post anything else. The name of this tag is “flicker mosaic tag”. First saw it in anoops’s blog and because of its uniqueness I fell in love with it that very moment. I was so excited to have my own mosaic that I made one even before shalini tagged me. Thank god I made my mosaic before hand. Now I have got something handy/ready to post at this very crucial moment. Wowwww! Isn’t my mosaic beautiful? … Any idea about the answers? 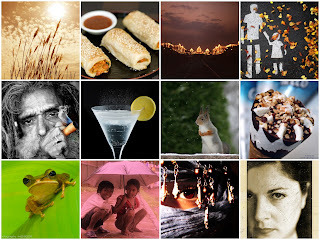 I tag: Sami, Lena, Divvu, Stephen, Rajesh, Jo, Kalyan, Sandhya, Rambler, Priya. I will be back soon. Till then don’t forget my white window. Oh wait! Are you able to relate my post and the title of it? Yes? …wowww! But no prizes for it :D. Do let me know what have you guessed. hmmm, hope to see more of your beautiful writings soon...this one is an interesting tag...lovely....have a nice time! I'll tend to the tag in a day or two... these things are always so much fun! Oh and regarding the title, was it implying that you are "Beauty" and the failed internet connection was the "Beast?" Yes yes !! The mosiaC is beautiphul . Good thing I put up the new blogger link list and found out you updated! It's ok sweetie,study well for your exams now.Keep writing whenever the urge hits,you can always post them later. I have seen this tag doing the rounds lately.Thanks for tagging me with this,would love to do it!One prob though,Flicker is blocked here :( I will use some other photo hosting site ok.
Hope u get a proper net connection soon at home...n keep rocking the blogging world.. I loved your mosaic...very thoughtful - very colourful !! Goodluck for the exams n be back with a zing ! Answer at own risk....hehhehe,even if I got it wrong,you won't be able to punish me since you are too busy with your exams,lolz..
Wishing you all the best and not to worry about blogging,do it once you are free and settle with your connection..
9/ ERRR frog= to meet a Prince Charming! !hehehhe,why not? p/s BTW I love the title..beauty=U,beast is your celebrity crush,right? Just becoz u don't post doesn't mean u cannot write. Keep writing when u have time and thaz a lovely piece of tag ther. I heard about white window from jo..very happy to be here..
will take time for me to read your previous posts..
Beauty is...u coming over ur block. Beast is...ur bad internet connection....right?